Bowhunter education certification DOES NOT substitute for Texas Hunter Education Certification. Classroom Course - 6 hours of basic instruction. Some courses may be extended in length to cover added topics. Online + Field Course - Completion of an approved online course plus a 4 hour minimum "field day" including live-fire and other skill-based activities. 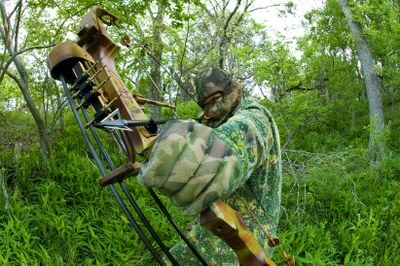 Be sure to look up and register for a bowhunter education field course near you prior to completing the online course. There is a $15 certification fee (NOT including the online course fee). Minimum age for certification is 9 years of age. Develop a high degree of stealth, perseverance, patience and effort. Become adept at scouting, tracking and recovering game. Master new archery techniques and learn the anatomy and behavior of the game. Explore Bowhunting - for schools, organizations and ranges.